Google Home app settings screen (left) compared to Google Assistant app. The Apple Music listing appears in Google Home version 2.9.118 as a music streaming option for Google Assistant. 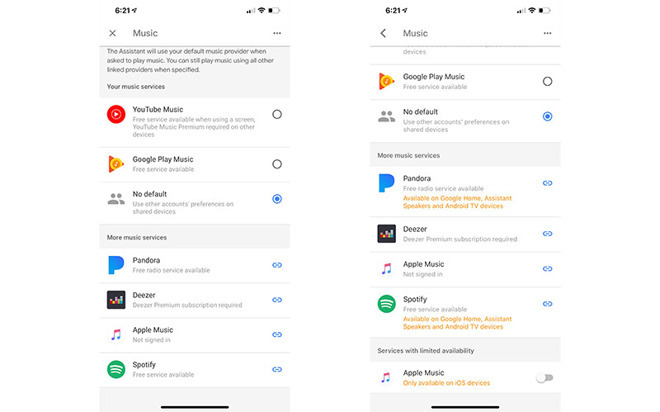 Specifically, the selection is displayed in Google Assistant's music settings under the "More music services" heading, which also includes options Pandora, Deezer and Spotify. Above "More music services" is a main "Your music services" section that notes support for YouTube Music, Google Play Music and a slot for a user's default player. Apple Music has appeared as a viable option in the Google Assistant settings menu for some time, originally located in a category named "Services with limited availability" and demarcated with the caveat "Only available on iOS devices." The current build of Google Home moves Apple Music into the seemingly more inclusive "More music services" section and strips it of the iOS-only qualification, suggesting more comprehensive integration is on the way. However, Apple Music does not appear in the Google Home app's dedicated media playback UI, which restricts user options to those apps that feature native compatibility with Google speakers. Along with apps already installed on a host iOS device, Google Home recommends 7digital Music, iHeartRadio, JioSaavn Music & Radio, Musixmatch, Napster Music Player, Pandora, Spotify, TuneIn Radio and YouTube Music. Apple Music is conspicuously absent from the list. As noted by MacRumors, which spotted the change, enabling Apple Music in Google Assistant settings does not activate the service on Google hardware connected via the Google Home management app. For now, playback is limited to those services listed under Google Home's main media selection page. The behavior is consistent with past versions of the app. When a service is enabled in Assistant settings, users are able to access music, podcasts and other media by issuing a voice command to Google Assistant, but playback is restricted to speakers connected via Bluetooth. In the case of Apple Music, a Google Home speaker can act as an output device, but native media handling features are not yet supported. Further confusing matters, the current version of Google's standalone Assistant app for iOS contains the same settings menu, but still lists Apple Music as an iOS-only service. Other services, like Pandora and Spotify, are advertised as "Available on Google Home, Assistant Speakers and Android TV devices." Whether the UI change in Google Home presages the announcement of native Apple Music integration for Google's lineup of smart home speakers is unclear. For now, however, Apple Music subscribers who want to listen to the service on Google Home and Android TV hardware must directly connect their iPhone or iPad to individual output devices over Bluetooth and issue commands through the Google Home app for iOS. Update: Google in a statement to Venture Beat said Apple Music is limited to Google Assistant, adding that it has "nothing to announce regarding updates to Google Home." The company also spoke to Bloomberg, blaming the UI change on a bug. The supposed feature was removed from the Google Home app hours after it first appeared.